Sentence 1: "Four score and seven years ago our fathers brought forth on this continent, a new nation, conceived in Liberty, and dedicated to the proposition that all men are3 created equal." Sentence 2: "Now we are engaged in a great civil war, testing whether that nation, or any nation so conceived and so dedicated, can long endure." Sentence 3: "We are met on a great battleground of that war." Sentence 4: "We have come to dedicate a portion of that field, as a final resting place for those who here gave their lives that that nation might live." Sentence 5: "It is altogether fitting and proper that we should do this." Sentence 6: "But, in a larger sense, we cannot dedicate--we can not consecrate--we can not hallow--this ground." Sentence 7: "The brave men, living and dead, who struggled here, have consecrated it, far beyond our poor power to add or detract." Sentence 8: "The world will little note, nor long remember what we say here, but it can never forget what they did here." Sentence 9: "It is for us the living, rather, to be dedicated here to the unfinished work which they who fought here have thus far so nobly advanced." Sentence 10: "It is rather for us to be here dedicated to the great task remaining before us--that from these honored dead we take increased devotion to that cause for which they gave the last full measure of devotion--that we here highly resolve that these dead shall not have died in vain--that this nation, under God, shall have a new birth of freedom--and that government of the people, by the people, for the people, shall not perish from the earth." 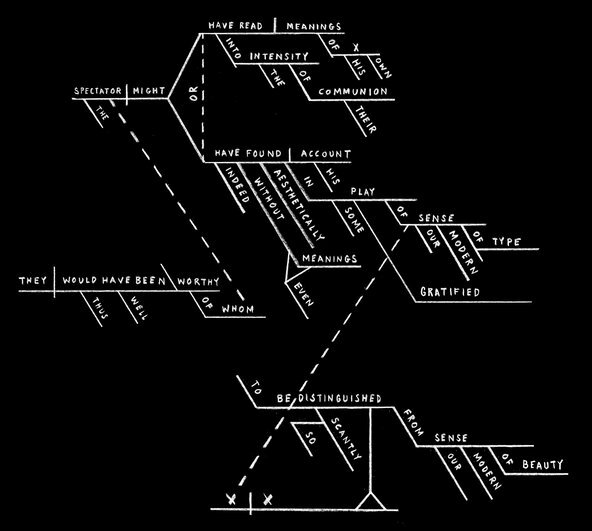 Diagramming sentences: what, after all, is it good for? Well, for one thing, it’s obvious that it’s good for stirring up controversy. The more than 300 comments (and close to 100 personal e-mails) in response to my last post, “A Picture of Language,” ran the glorious gamut from “love it/taught me to write/thank you, Mrs. Wengler!” to “ridiculous waste of time/confusing/who needs it?” I was delighted to see that 400+ people can get passionate in print about the subject. But questions remain. Once we have mastered the arcane skills diagramming requires (prepositions on slanted lines, gerunds on little staircases, etc. ), are we better writers? What does diagramming sentences teach us besides how to diagram sentences? I would answer: It teaches us a lot. First of all, it illuminates points of grammar. When constructing a diagram, we focus on the structures and patterns of language, and this can help us appreciate it as more than just a vehicle for expressing minimal ideas. (If language were good for only that, OMG, TMI, RUOK and their ilk would fill our needs.) When we unscrew a sentence, figure out what makes it tick and reassemble it, we interact with our old familiar language differently, more deeply, responding to the way its individual components fit together. Once we understand how sentences work (what’s going on? what action is taking place? who is doing it and to whom is it being done? ), it’s harder to write an incorrect one. The spectator of whom they would thus well have been worthy might have read meanings of his own into the intensity of their communion — or indeed, even without meanings, have found his account, aesthetically, in some gratified play of our modern sense of type, so scantly to be distinguished from our modern sense of beauty. Here is where I laid the book. 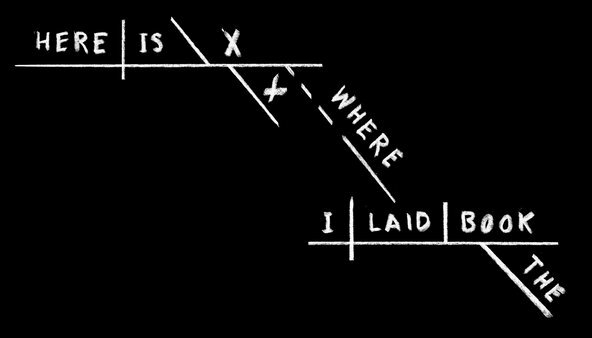 The x’s denote the unexpressed but implied predicate nominative “the place.” (The x on the line denotes “place”; the x below is “the,” which modifies “place.”) If you tried it before Gene stepped in and rescued you, you probably increased your brain cells by, let’s say, at least 12 percent. Obviously, I recommend diagramming, but I do have a couple of caveats. But dozens of others have written to say that they consider diagramming anguish and drudgery. On a less emotional level, they point out that it involves mastering not one skill but two: the rules of grammar and syntax and the making of diagrams, which is something like baking a loaf of bread and cutting it into fancy shapes before you can make a sandwich. And the tougher the sentence, the more impenetrable the diagram. I suspect that a lot of us who “loved” diagramming in school (including me) would be defeated by the Henry James sentence. Diagramming has other limitations, too. Even if it enlightens us about the parts of speech and how to use them, it teaches us nothing about punctuation, and it can’t help with spelling. You can diagram “The dog wagged it’s tail” perfectly, but you’ll remove that pesky apostrophe only if you already know the rules for apostrophes. As an editor who has seen too many “marital arts” movies and “singers” of the Declaration, I advise writers to polish and proofread everything before it goes out into the world, even if it’s just an e-mail or a text. Probably the best way to learn the technicalities of language and usage is not to diagram but simply to read books that are full of good sentences. Our observant brains will soak up the rules. It is the surest route to becoming a better writer — as opposed to merely a grammatically correct writer. If your kids are having trouble with grammar, or their school is one of the many that no longer teach it, read to them, give them books for their birthdays, drive them to the library on Saturday mornings. As for the verdict on diagramming? The wimpy judgment, but unfortunately the only one that makes sense, is that it is like broccoli: it’s good for you only if you can stomach it.